Widespread in wet ground: marshes, shores, banks of ditches and streams, bog borders and clearings, pastures, etc. ; moist open forests and thickets. 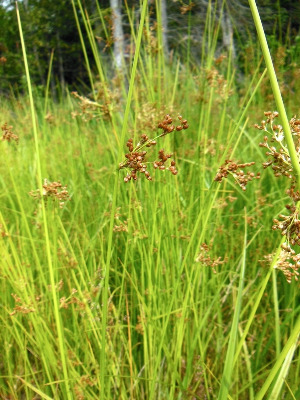 This is often a coarser plant than Juncus pylaei, with longer inflorescence branches (except in “congested” forms) and stouter stems. The sheaths are pale brown, often darkening to dark brown or dark reddish brown at the base, but lacking the purple black color often seen at the sheath bases of J. pylaei. The tepals are often shorter than in J. pylaei, ca. 2.2–3.4 mm, and are sometimes shorter than the mature capsule. A few collections from Laurium and the Quincy Mine area, in Houghton Co. are the introduced Eurasian subsp. effusus, differing from the native eastern subsp. solutus in having sheath margins dark-edged apically and clearly spreading tepals. Depauperate or fragmentary specimen in this complex can be quite difficult to name. MICHIGAN FLORA ONLINE. A. A. Reznicek, E. G. Voss, & B. S. Walters. February 2011. University of Michigan. Web. 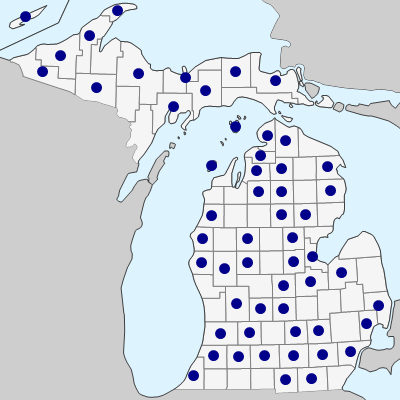 April 24, 2019. https://michiganflora.net/species.aspx?id=1510.